Provide comfort for the family of Angelo P. Zangari with a meaningful gesture of sympathy. 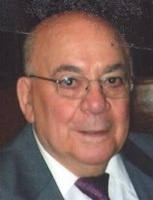 Angelo P. Zangari, 94, of New Britain, CT. peacefully entered into eternal life, surrounded by his family Saturday, March 16, 2019 at Ledgecrest Health Care Center in Kensington. Angelo was born on December 5, 1924, and was the son of the late Nicholas and Rose (DeMaio) Zangari. Angelo was predeceased by his wife of seventy years, Lucy (Melfi) Zangari who passed in September, 2017, and two children, Angelo Vito Zangari in 1963 and Maryann Zangari in 1972. Angelo was a devout Catholic with an intensely strong faith and was a Fourth Degree Knight in the Knights of Columbus. He joined the U.S. Navy at high school age and served his country on the battleship USS Iowa from 1943 to 1946 as a Seaman 3rd class. Angelo served proudly and patriotically and was fiercely driven by his burning love of his country. A highlight of his service occurred during World War II, in 1943 when the Iowa secretly transported President Roosevelt and his Chiefs of Staff to the Tehran Conference where Roosevelt was to meet with Stalin and Churchill to strategize about Germany. Following his service Angelo married the love of his life, Lucy Ann Melfi of Stamford, CT, then settled in New Britain, CT and raised his precious family of four sons and a daughter while spending most of his working years at Chandler Evans Company in West Hartford. Angelo loved rooting for his NY Yankees and NY Football Giants and in his younger days brought his sons to see games at Yankee Stadium and Fenway Park. He was an avid Hartford Whaler hockey fan and season ticket holder and would ride the bus from Hartford to attend Whaler games in Springfield, MA becoming a charter member of the “91 Club” following the Civic Center roof collapse in 1978. After retiring he and Lucy spent time traveling around the country to USS Iowa reunion events and to vacation spots in Nevada and Arizona. Angelo very much loved all family holiday gatherings, and frequent summertime barbecues. He cherished his children, grandchildren and great grandchildren. Angelo is survived by his three sons, Nicholas Zangari of Ellington, CT, Matthew Zangari and his wife Anne of East Berlin, CT and Mark Zangari of Bartlett, NH. He also leaves ten grandchildren: Jessica Salafia and her husband Emmanuel, Matthew Zangari and his wife Carrie, Adam Zangari and his wife Jackie; Alison Anderson and her husband Thomas, Kathryn Zangari and her fiancé Rich Scherer, Jack Zangari, Annie Zangari; Amberley Zangari, Halley Ferry and her husband Keith, and Jodi Zangari, sixteen great grandchildren: Peter and Aaden Zangari; Kahlan and Margaret Zangari; Julie, Grace, and Anneliese Salafia; Henry and Sam Anderson; Victoria and Natalie Scherer; Reece Chandler; Carter Zangari, Jaxson and Brooke Ferry; Connor Lennon, his three sisters; Felicia Fortune, Stella Riccio and Frances Cusanelli and numerous nieces and nephews. Angelo was also predeceased by his sister Rosemarie Grue. The family of Angelo P. Zangari would like to extend our sincere thanks to all of the staff at Ledgecrest Health Care center for their extraordinary care and support over the past sixteen months. 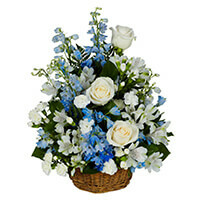 To send flowers in memory of Angelo P. Zangari, please visit our Heartfelt Sympathies Store. We encourage you to share your most beloved memories of Angelo P. here, so that the family and other loved ones can always see it. You can upload cherished photographs, or share your favorite stories, and can even comment on those shared by others. Kevin and Kathy sent flowers to the family of Angelo P. Zangari. Never met him but I know Mark and he must have been a great father even if he was a Yankees fan. Kevin and Kathy purchased the PEACEFUL WISHES BASKET for the family of Angelo P. Zangari.